The popularity of the spy genre in the 1960s brought us the 1966 film The Quiller Memorandum. The character Qullier was originally written by novelist Elleston Trevor—under the pseudonym Adam Hall—as a British agent in the 1965 novel The Berlin Memorandum. In The Quiller Memorandum he is an American played by American actor George Segal, but he is still working for the British. 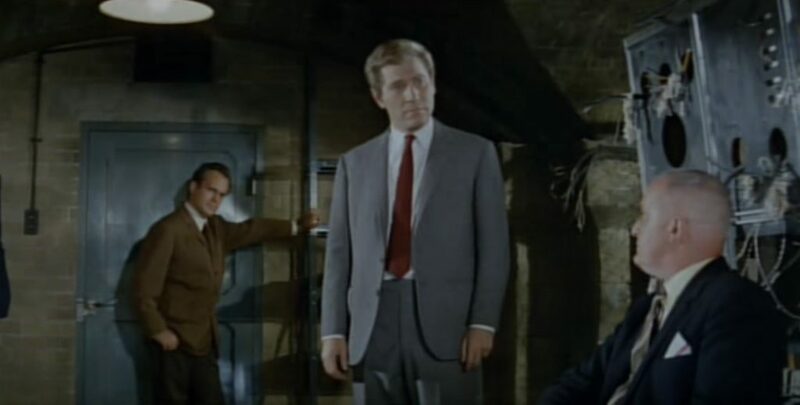 The Quiller Memorandum has a few things in common with the James Bond series, including a John Barry score (which is very different from his Bond scores), a song sung by “From Russia With Love” singer Matt Monro, and a villain played by Max von Sydow (who played Blofed in the unofficial Bond film Never Say Never Again). 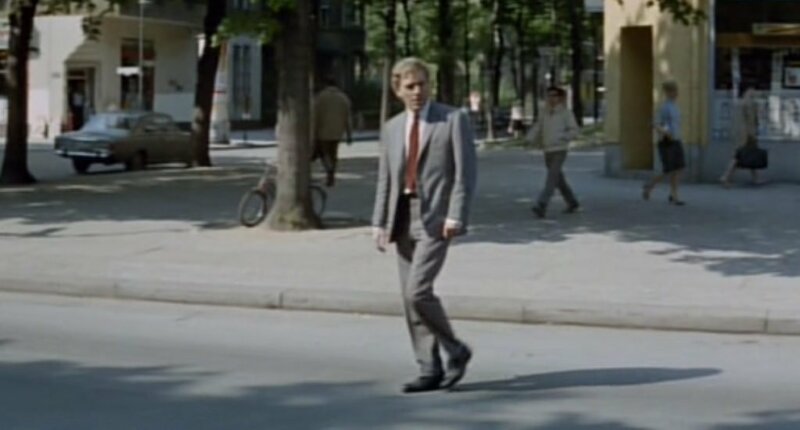 Though the film is not especially unique or interesting, the main character is well-dressed in a Bond-like manner. 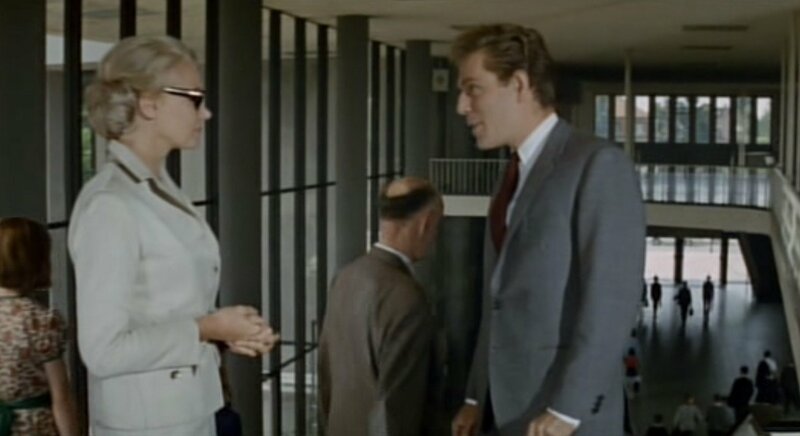 Like Cary Grant does in North By Northwest, George Segal wears a single suit throughout almost the entire film. Only in the final scene of the film does Segal change his clothes. 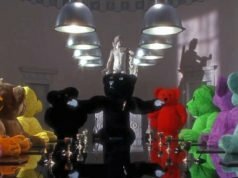 But unlike in Northwest By Northwest, the suit in The Quiller Memorandum never has a chance to get cleaned. 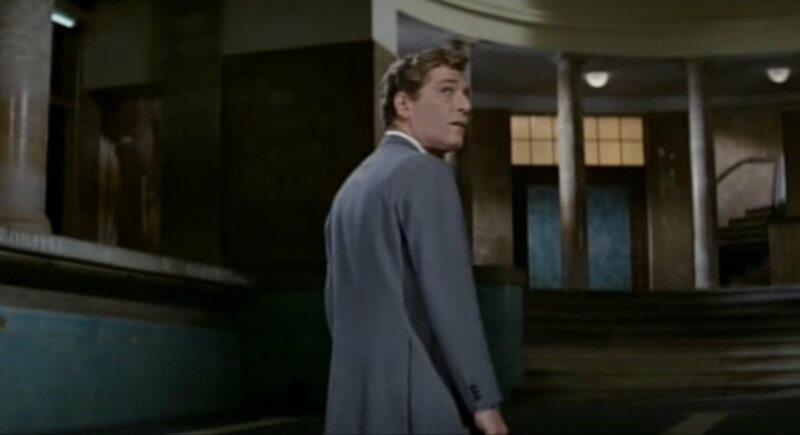 Though Quiller is an American in this film, the film was made in England and Germany, and George Segal is almost certainly wearing an English suit. 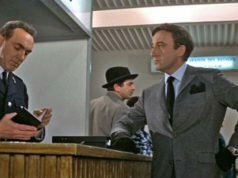 Like Sean Connery’s Anthony Sinclair suits, Segal’s suit has an unassuming look that is perfect for a spy. The suit is tailored in a Bond-like lightweight medium grey pick-and-pick wool and has a similar cut to Sean Connery’s Anthony Sinclair suits, but with a few notable differences. The suits are similar in that jackets both button two and are cut with soft shoulders, roped sleeve heads, a full chest, a gently nipped waist and narrow lapels. Instead of the low button stance on Connery’s suit jackets, Segal’s suit jacket has a medium button stance. Segal’s suit jacket is cut with a slightly short length to reflect the contemporary trends, but the jacket is just long enough to cover his buttocks. It is detailed with jetted pockets, three cuff buttons and double vents. Black buttons contrast with the jacket. The suit trousers have an extended waistband with a hidden hook-and-eye closure, “Daks top” side adjusters with two buttons, slanted side pockets, front darts (positioned in front of the pockets) and straight legs with turn-ups. Under the suit, Segal wears an ecru shirt with a point collar that has a lot of tie space, a front placket and rounded single-button cuffs. The cuff button is placed near the base of the cuff. The textured burgundy tie is very flattering to Segal’s warm spring complexion and blonde hair, and he ties it in a four-in-hand knot. Segal wears black lace-up shoes with his suit. George Segal wears clothes by On Her Majesty’s Secret Service tailor Dimi Major in the 1973 film A Touch of Class. 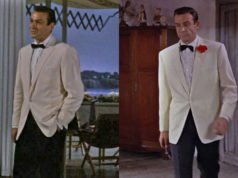 The suit in The Quiller Memorandum shares a slight resemblance with Dimi Major’s cut, and the shoulders on Segal’s suits in A Touch of Class look identical to this suit’s shoulders. The Quiller suit lacks the fashionable flair that could be found on George Lazenby’s suits three years later, and though the shape of the jacket’s lapels is different, the trouser style is the same. There is a possibility that Dimi Major could have made this suit. You say that the jacket is cut slightly short, yet in the first picture it looks like it’s the correct lenght when compared to the lenght of his arms (the way I understand it, the jacket should come down to just about half the length of the thumb, just as this jacket does). However, I do agree it does look short on him, but mabey it’s because his head looks large and that the jacket doesnt have so much waist supression? The jacket is unbuttoned in that photo, as it is in most of the film. When unbuttoned the jacket’s front will hang a bit lower. The arms are also the least reliable way to judge a jacket’s length. The overall length of the body must be considered. That is interesting. It seems that the “classic” lenghth of a jacket is mostly said to be half the lenght of the thumb. Pierce Brosnan’s jackets in GE and TND are clearly too long, and Daniel Craig’s jackets in Skyfall are clearly too short. How does one know wich length works the best? Arms can vary a little in proportion to the body, which is why it’s not a reliable indication of proper jacket length. The most reliable method of figuring out jacket length is that it should be half the length from the base of the neck to the ground. For someone with a long torso, the jacket may need to be longer to cover the buttocks. Segal appears to have short arms – the opposite of George Lazenby, who said in an interview that he picked up a suit intended for Sean Connery from Anthony Sinclair and ended up having the sleeves lengthened. Segal’s suit fits well but is rather nondescript – nothing remarkable, let alone glamorous about it. On a different note, Brosnan’s jackets in GE and TND were not THAT long; Brosnan was slim and long-legged, and I suspect that shorter jackets would have made him look like a stork. Interesting, esoteric post, Matt. I always liked this movie actually for a number of reasons; the evocative depiction of mid-Sixties Berlin, the superior script by the excellent Harold Pinter, the terrific Barry score you mention and the lovely Senta Berger as Segal’s love interest. The suit is fine but it would come somewhere behind these other factors for me! I agree. It’s an interesting film – it isn’t amazing but its definitely worth a watch. The tailoring, however, probably isn’t one of the main things to tune in for. This isn’t a particularly memorable suit but, as Matt points out, that probably makes it very suitable for a spy. Sorry, not a satorial but rather a movie trivia: Never Say Never Again’s Blofeld was played by Austrian actor Klaus-Maria Brandauer, not by Max von Sydow. Duh, you guys are right! – Sorry for my interruption. It shows once more the excellent quality of this site!